Dieters are often uncertain on how to effectively follow the 21 day Phase 3 Stabilization and many fear they will gain the weight back. Sonia E Russell, LPN, licensed nurse, professional hCG diet coach, and author of the HCG Diet 800 Calorie Protocol has teamed up with certified personal fitness trainer and hCG diet coach, Candice Ekberg, B.S. 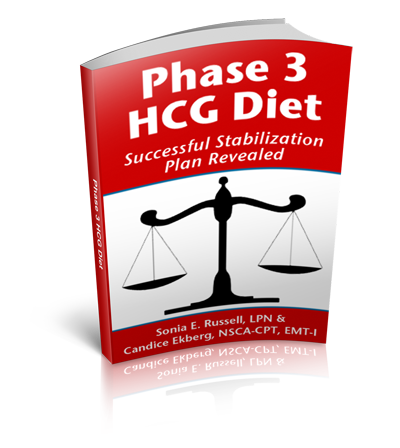 ESS, NSCA-CPT, EMT-I .They have combined their years of hCG diet coaching, knowledge in nutrition, fitness training, and medical background to develop a structured and comprehensive Phase 3 plan that will help ensure stabilization, prevent the frustration of chronic correction days, avoid unnecessary additional rounds and the possibility of gaining any weight back. Their Phase 3 plan will reduce stress to the hypothalamus by prohibiting the dieter to over-indulge on sugars, starches, grains, breads, nuts, beans and limiting most dairy. The expanded Phase 3 plan includes a comprehensive 3 week food tracking guide, Phase 3 overview, the science behind stabilizing, Phase 3 food items, how to read food labels, Phase 3 calorie conversion chart, the interval between rounds, understanding basal and resting metabolic rates, Phase 3 exercise, how to begin Phase 4, and a large assortment of delicious Phase 3 recipes. By following the structured Phase 3 plan, the dieter will have the tools to enable a successful stabilization.